My client and student, Tom F. Leary, sent me a note (and a great photo) about his new pop filter. He modeled it after my own. I push the medium-strength athletic sock in the VO2GoGo training classes for a couple of reasons: they’re inexpensive compared to the foam and stretch-stocking-ring pop filters, and…they work. The same weave that wicks sweat away from your feet is also acoustically clear. And now, he’s got 3 spares to use when the first one wears out. I sure hope he wasn’t serious about going to 4 different stores. David, I went with brown one. A little More subdude. Not so much panache but it does work quite well and fits in with any decore. Although tougher to find in the dyer. Only a sock? Interesting. 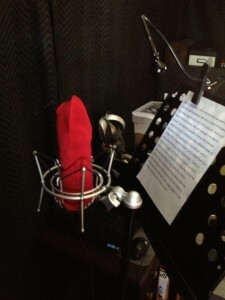 I just made my own pop filter out of an embroidery hoop, some cut-up nylon stockings and a copper wire. 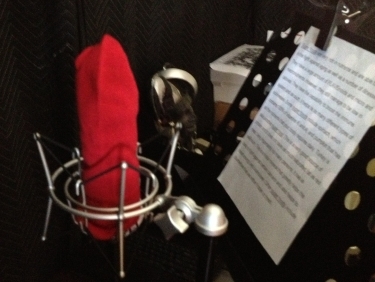 And that pop filter will keep you too far away from the mic to do intimate work – that kind of pop filter is for singers, not VO talent.